Light Energy | How Does it Work? No. Laser therapy is non-invasive and painless. 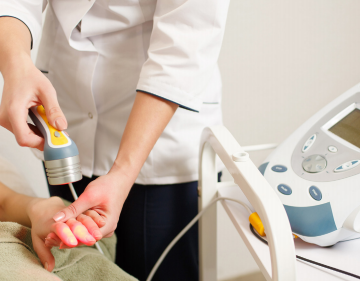 Developed more than 35 years ago, Cold Laser Therapy is a remarkable process that uses light to penetrate the skin's surface and underlying tissues. Light energy penetrates the skin and is absorbed by the mitochondria of cells of all types. This light energy is converted into biochemical energy, restoring normal cell function. As all cells can absorb light, this therapy offers effective treatment of the nervous, skeletal, immune, vascular and lymphatic systems. MedX Phototherapy stimulates your body's natural healing process, safely and effectively.